Recently I paid in full a deposit on an Australian Shepherd puppy. We were looking for a red merle female and we finally found a breeder. My question is in the first pictures we received before we deposited on her she looked like a red merle but in the latest picture we received she clearly looks like a blue merle. I've attached both pictures and am wondering will her pattern change red as she gets older or should I ask for my deposit back now? That definitely looks like a blue merle to me, truthfully in the first picture I can see where it's confusing. I can see it a little in the first picture, looks like a blue. She did look sort of red in the first picture. But I see a blue and not a red. My own aussie is a red tri and she was super red when she was little. They normally do not change colors to much, like they may have a brown base and shed out to a lighter red, but they dont go from red to brown. Yes this is a Red Merle puppy. He/she looks like a beauty.I have a Blue Merle with blue eyes. He is so smart and a beauty with a huge white collar. Do you have any more pictures? People have commented on the Aussie Lovers Facebook page and questioned if it's even the same puppy in pic 1 vs pic 2 and 3. I have a red Merle but in younger pictures she favors the blue and even still at an older age some people think so but you can clearly tell she is a red in person, her spots are a brown and the coat and light brown but can be mistaken for grey. The more we groom her and once she lost her puppy coat more red has seemed to pop out! the picture of your puppy reminds me a lot of our little girl! So I would wait until you see her in person! I'd ask for more pictures if I were you. Pup definitely looks red in the first pic and blue in the last, but the lighting in the last pic looks like a flash could be throwing the color off. 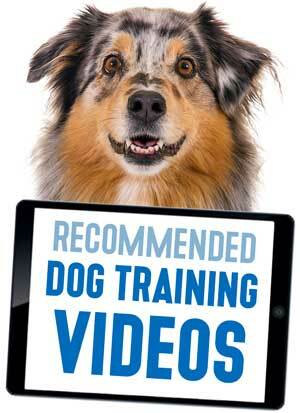 You should also look into breed standard. 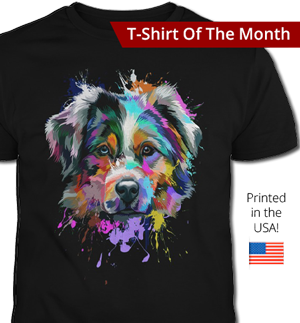 Aussies are to have color all the way around the eyes which could also indicate health issues. Both pictures look just like my blue Merle liters. So many reds I have seen were much more liver in color. Lighting plays a large parts with pictures. Looks like first is in the bathroom which tend to have an yellow orange tint to them which can darken and off color. Only outside slightly overcast or photo lighted studios give exact color. Either way ask for more pictures from each angle. Check markings. BEWARE of all white head and face ! May develop lethal white ! May go death and or blind research first . Most breeders will not sell with this ! Happens when merles are breed together ! Need to breed merle to black and white tri . We breed our blue to b & w tri had 6 blues and 5 tri ! 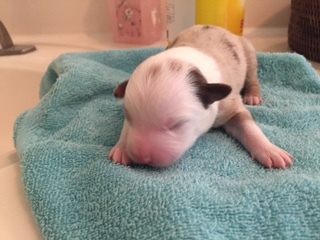 Regarding the color around the eyes, it is common for newborn pups to not have color around their eyes at birth, so please don't worry about that part yet. My mini red merle also had a mostly white face when he was born (ears had color), and within 3 weeks the color around his ears started to spread down over his eyes. 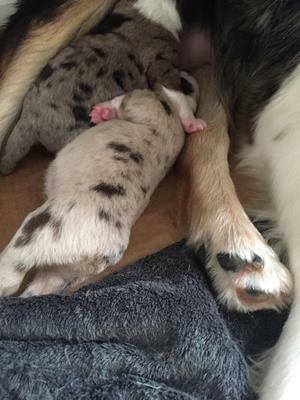 Also, about color, when my pup was born he clearly looked like a red merle. About a month later, he started looking like a blue merle. At 6 weeks old, he was clearly a red merle. I wish I could attach pics to show you! Red merle or blue merle, the big concern about this sweet pup is the WHITE around the eyes. We've bred our female black tri with a red merle male a couple of times. From the pups we had, to the pup you bought, your pup is definitely a red merle. I have 3 of them at home. They look pretty similar when pups. But the key difference is their coat color and the spots on their coat. Red merles have a redish/brown/white coat with white and copper markings. Usually their spots are a brown color. Which is what you pup looks like to me. As for the Blue merles, they have a greyish/black/white coat with white and copper markings. Usually their spots are black. 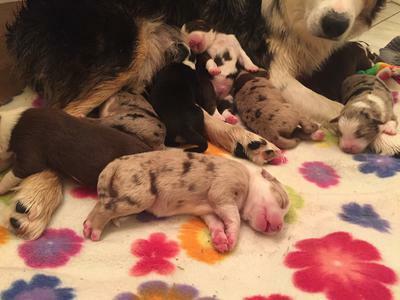 In the second pic you posted, if you look at yours in the front with the pup in the far right corner, you can tell a difference between your red merle pup and the blue merle pup. The lighting may be throwing it off a little. But if you still are sure, contact your breeder. You have a right to more photographs to confirm what you bought. Definitely a red merle. "Reds" can be brighter to a darker shade that is called liver... all acceptable. I would say this one's darker areas will be liver colored. I have a black-tri & red-tri, and my son has a red-bi. His is definitely closer to liver color, whereas mine is brighter red. Should be very pretty! Look at middle photo... you can see what a blue merle looks like compared to your red merle puppy. Next to the puppy in one picture is a blue merle. Definitely can see the difference. If the breeder is reputable there will be no problem. I have a red merle that's just red tan and white and another that's mostly blue but because she has red around her eyes and on her paws she's red merle even though her body is blue. The tan points make her officially red per AKC. She's unusual looking and very pretty, yours will be also.